This year’s RILKO Summer outing will visit the “Royston Cave”, a feature that was accidentally discovered in 1742, in the little market town of Royston. 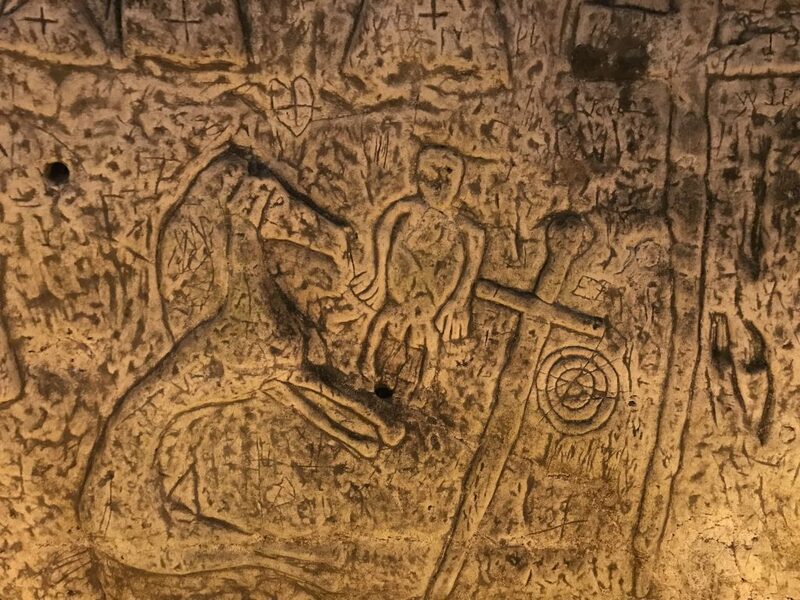 When the rubble was removed, the chalk walls of the cave were found to have been deeply sculpted with images of 14th century religious and secular significance. The theories as to its use have included a room for initiation, a temple used in the survival of “Templar” devotees in the tertiary orders, a gathering place for an unorthodox prayer group and a chapel for other cult rituals. Researchers into lost knowledge may find it of great interest. The town of Royston is situated on the crossroads of an old Roman road (“Ermine Street”) and an ancient trackway (the “Icknield Way”) running from Wiltshire to Norfolk. Between London and Royston, “Ermine Street” is aligned very closely with the modern-day A10 road and also with the Greenwich Meridian, which runs due north from the Royal Observatory, in Greenwich Park, London. The selection of the Greenwich Meridian as the prime meridian and the international standard for zero degrees longitude was made in 1884, at the International Meridian Conference, in Washington DC, in the USA. The path of the “Icknield Way” very closely follows the eastern section of the Michael and Mary lines, which run from the tip of Lands End to the Norfolk coast. These two energy lines cross within the Royston Cave itself and also near several tumuli on a hill to the west of Royston. Weather permitting, it is also hoped to climb to this hill from the nearby car park, so bring your binoculars and camera! The town of Royston is more fully described in “Axis of Heaven”, the book written by Paul Broadhurst and Gabriele Trso, which was reviewed in the RILKO Journal number 91. Please confirm attendance to Patrick MacDermott, either by mobile on 07757 153054 or by email to pjmacdermott@yahoo.co.uk – car share can also be arranged from north London (at Oakwood tube station, on the Piccadilly line, at 11am) or by pick-up from Royston railway station, please liaise with Patrick on this.